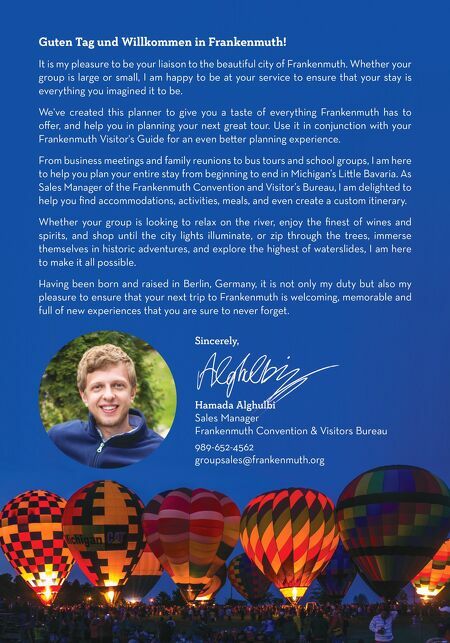 Wilkommen to Frankenmuth ! Willkommen. In German, it means welcome. An offer to come and join in. Something you don't hear enough of these days. Well, there is a place that's all about being welcome. Welcome to family time. Welcome to playtime. Welcome to Christmas time all year long. Welcome to Frankenmuth. Michigan's Little Bavaria, where we find all the things that make time together so meaningful. It's a place of horse drawn carriages and covered bridges. Of riverboat cruises and world famous chicken dinners. Of big waterparks and small town strolls. So when you need to simplify the agenda, when you want extraordinary experiences with new friends, come visit us at a place where you'll be welcomed with the warmth of history, heritage and happiness... Welcome to Frankenmuth. What's Inside Travel Tips 3 Getting Here 4 Festivals & Events 5 Lodging 11 Dining 13 Group Tours & Motorcoach 15 The Many Tours of Frankenmuth 19 Girls Getaway 21 Educational Tours 25 Planning a trip? 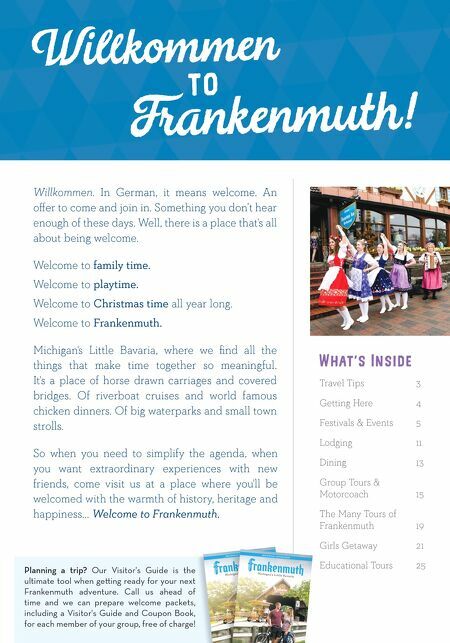 Our Visitor's Guide is the ultimate tool when geing ready for your next Frankenmuth adventure. Call us ahead of time and we can prepare welcome packets, including a Visitor's Guide and Coupon Book, for each member of your group, free of charge!